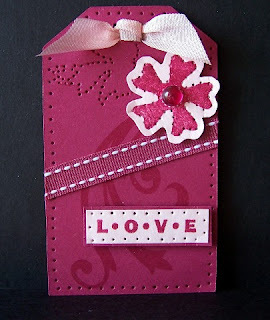 I signed up for a pierced tag swap and this is what I came up with for the LOVE theme. I used Stampin' Up! In Colors Purely Pomegranate (retired) ink, cardstock and double stitched ribbon, and the new In Colors Pink Pirouette cardstock. I also used a pink skittle for the middle of the flower. The light pink ribbon is from Martha Stewart. Stamp sets are "so many sayings" ( retired), and "stitched exotics".